Datatag, the market leading security products provider and the power behind the official CESAR plant security and registration scheme, is using the Executive Hire Show to promote a new innovative security product to protect small tools and equipment, including drills, hand held breakers, cutters, grinders, saws, tampers, and hand guided compaction plates. The specially structured package combines a number of sophisticated technologies to give each tool a unique ‘fingerprint’ that is impossible for thieves to remove. 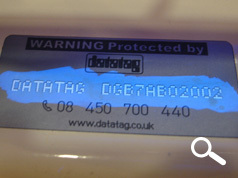 The sophisticated protection includes an ultra-destruct label with a unique identification number which incorporates ‘stealth UV etching technology’. 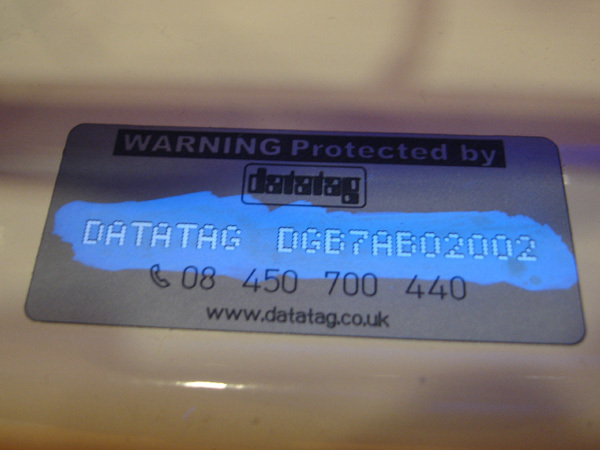 Even if thieves remove the label the unique Ultra Violet fingerprint will continue to positively identify the tool. Larger pieces of equipment, including micro and mini-excavators, skid steer loaders, and site dumpers, should be protected with CESAR, the market leading machine security and registration system. Since its inception, in 2007, over 75,000 construction and agricultural machines have been fitted with CESAR registration and security, making it the most successful scheme of its type in the world. Recovery rates for stolen CESAR registered machines are 6 times higher than that achieved by the police before the inception of the scheme, running at over 30%. CESAR registered machines are 4 times less likely to be stolen than unregistered machines. Leading equipment manufacturers including JCB, John Deere, New Holland, and Manitou fit CESAR as standard on machines sold into the UK. The new Datatag small tools and equipment security kit is available for ‘self-fit’ directly from Datatag. A pack of 25 kits sells for £99.00 (excluding VAT and delivery), giving lifetime protection to valuable small tools and equipment for under £4 per unit!